In case you aren't aware, my childhood hair style left much to be desired. Using a hair dryer on a boy haircut was never really necessary. Eventually in high school, I grew my hair long. Some kind soul, I think it was the hairdresser of the woman that I babysat for, introduced me to a diffuser. Thanks to Jill, a girl in my senior year homeroom I discovered hair products that were intended for my hair type. This Jill chick offered me unsolicited advice about moose - it was the 80's after-all. Fortunately, it wasn't rude 'I-can't-believe-you-wear-your-hair-like-that' advice. Between hair products and the diffuser, my hair entered unchartered territory. Normalcy. I've used a diffuser ever since. My diffuser is the same one that my mom shipped to me when I was studying for a year in Ireland after my other one broke. It attaches to most hairdryers. I wish I could remember when I purchased my hairdryer. It was forever ago. If I had to guess, I would say that I bought it around 15 years ago. Over time the back vent thingie filled up with lint and it became less powerful. The less powerful aspect complimented my gradually thinning hair. I steer clear of the models that boast: 'fast dry.' If my hair dries too fast, it resembles a bale of hay. Not enough high-end hair care products exist to combat that. Vent thing that I jammed with dryer lint. A few years ago, I stupidly cleaned out the aforementioned rear vent thingie. The dryer started working on overdrive. It was like a wind tunnel right in my bathroom. I panicked and went to the store to replace it. I gave Mini my old, beloved dryer. 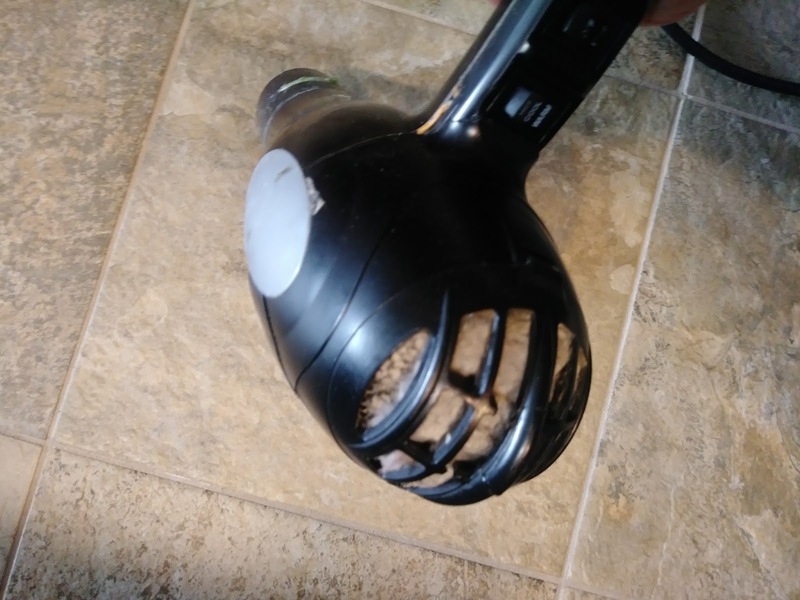 I used the new hair dryer once and hated it. I quickly went to the kids' bathroom to swap the new dryer for my trusted one. In the MINUTES that Mini had 'owned' it, she managed to make it her own. She decorated it with colorful strips of duct tape. Cute. No matter. In an act of desperation, I snatched some lint from the clothes dryer vent and stuffed it inside the rear vent thingie. Worked like a charm. 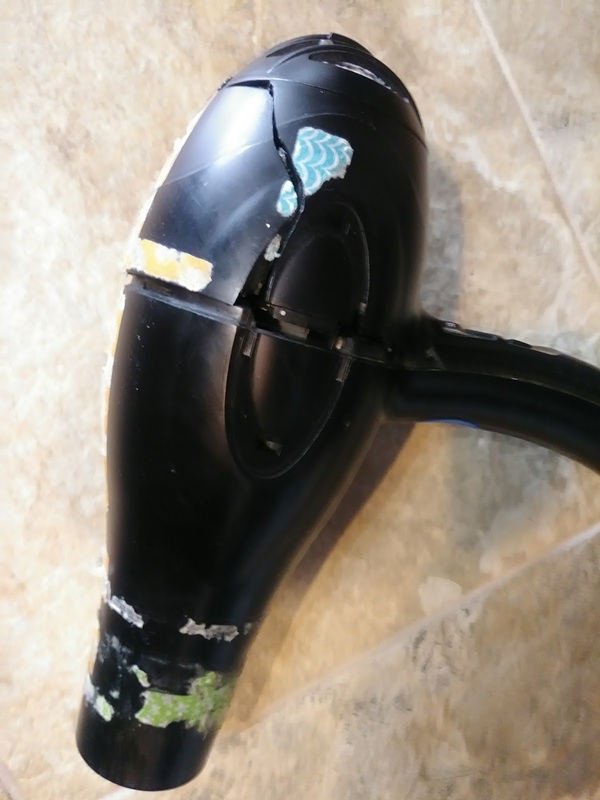 Of course now I was the proud owner of a hairdryer covered in melting strips of duct tape combined with lumpy lint inserts protruding out the rear vent thingie. But, it could still simulate a hair drying experience similar to a toddler blowing barely blowing out his birthday candles - minus the spit. bits of colorful duct tape. to function despite it all. That old trusted dryer broke last week. It certainly served it's time. I can't help but mention that Mini had been using it on a regular basis. And she dropped it. The next day it started smelling like something was burning. I'm not 100% sure why she wasn't using the newer hairdryer that I traded with her. I think it was because she liked the diffuser that was attached to my antique version. I bought a replacement on Amazon. I've used it twice. It's OK, but it's not like my original. My original is so ancient the writing has been rubbed off of it. I believe it was a Conair. You wouldn't believe the matches that pop up when I search for a hairdryer to blow dry thin hair. There are lightweight dryers, fast dryers, shiny-hair dryers. Where oh where are the hairdryers that barely blow? That's it. This definitely blows. I absolutely love the fact that she decorated the hairdryer with colorful duct tape! What a girl thing to do! And the fact that you stuffed dryer lint in it is brilliant! I'm assuming you have curly hair. I read a blog (Book of June) and the writer has curly hair and she has been using the Laila Ali Bonnet Dryer and she seems to really like that. Book of June sometimes too. I will look into it when I return from Scotland.